Via Lawyers, Guns & Money, I see that Bill Moyers, one of the absolute icons of progressive liberal journalism in America, is at long last retiring. I'd have to sit down and really think for moment to come up with just how many dozens of his news stories, television specials, and educational videos I've watched and learned from over the years (though his tremendous work on the corporate corruption of the electoral process stands out). But I don't have to think to remember his first and most lasting impression upon me, as that I can't forget. 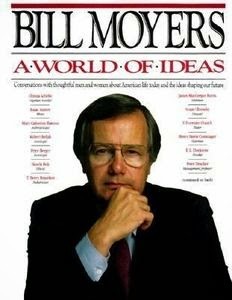 It came through two books: the two volumes of A World of Ideas, edited transcripts of interviews which Moyers conducted numerous scholars, writers, artists, scientists, and public intellectuals in a couple of series of broadcasts, in 1988 and 1990. Those were the two years that I was serving a church mission in South Korea; fortunately, though, these books made available to me later everything I missed, when I discovered them in a used bookstore sometime in 1991 or so. What brilliant and wide-ranging interviews they were! As a recently-returned Mormon missionary, a confused and intellectually ambitious and at-loose-ends young adult, pouring through these pages, reading a conversation with accomplished men and women who'd spent decades building scholarly edifices for their ideas...it was an absolute revelation. Politics, history, philosophy, ethics, art, religion, literature, engineering, science-fiction: it was all there. Sheldon Wolin, Elaine Pagels, Barbara Tuchmann, William Julius Wilson, Forrest McDonald, Tom Wolfe, Noam Chomsky, Tu Wei-Ming, Jonas Salk, Cornel West, Michael Sandel, Martha Nussbaum, Isaac Asimov, E.L. Doctorow, and more, all deep into their research and writing, all displaying for an unformed young person exactly what Moyers truly, deeply believed in: namely, the democratic and liberating power of talking freely and sustainably about ideas. That, more than anything else, is what Moyers, for close to fifty years, has enabled the mass media to do. My hat is off to you, sir. Thank you. Saturday Night Live Music: "Rise"
Saturday Night Live Music: "Coming Around Again"
Saturday Night Live Music: "Big Country"
Saturday Night Live Music: "Bloody Mary Morning"